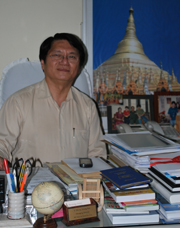 The Irrawaddy speaks with Maung Maung Swe, who currently sits as both the chairman of the Union of Myanmar Travel Association and the vice-chairman of the Myanmar Tourism Board. Question: Tourism is widely expected to increase greatly in Myanmar over the next year. How can the infrastructure—specifically the number of hotel rooms, flights, transport services and health facilities—react quickly enough to meet these demands? Answer: That was the main problem we discussed at a forum in Bangkok two days ago [Jan. 29] and at the Asean Tourism Ministers’ Meeting in Indonesia before that. The point is that there is a new government now. It has changed all the policies and is willing to receive more tourists. The first thing to deal with is the fact that our Myanmar currency has strengthened. It was previously 1,200-1,300 kyat per US dollar. And then immediately before the election, everything started to change. It went down to 700 kyat. We were worried about that. Of course, most people think that if your currency is strong it is good for the country, but it affects exports negatively, as it does the tourism sector. A: For example, European people plan their holidays six months or one year ahead. So for our tourism business in Europe we had to give quotations six months or a year in advance. For the Asian market, it is only two or three months. But our prices given to the European market were based on a dollar value of 1,000 to 1,200 kyat. All quotations are fixed in dollars. The hotels sold their rooms at 1,000 to 1,200 kyat but now—when the people arrive—they are only paying 800. That’s why we have had to increase our prices. We pay local currency to all our workers and for all our expenditures and services. These costs have therefore increased dramatically. The hoteliers need to pass that on to their guests. But we have a free market policy, so we cannot interfere. They can put their prices up if they want. Q: Nevertheless, influential publications such as Conde Nast, the New York Times, Travel and Leisure, and Lonely Planet have all recommended Myanmar or predicted the country will be a hotspot in 2012. Can you fill the demand for flights and hotels immediately? A: We are discussing this matter at our ministry [Ministry of Hotels and Tourism—MoHT] and in the private sector right now. You can see that in Davos all the CEOs were saying, “We have to go to Myanmar, we want to invest there.” The Sheraton, Westin, Marriott—they all say they want to come back. Some, like the Marriott, invested before. But they withdrew, I think, because of pressure from their governments. Now I think they will all want to come back. I think they will begin surveying the situation this year, but will not return until next year. Q: Is that at all related to inflation in Myanmar? You can see in the MoHT figures for 2011 that there are 731 hotels in Myanmar—only 25,000 rooms. Of that number, only about 8,000 are suitable for tourists. In Yangon, less than 3,000 rooms. At the most recent meetings I suggested to the MoHT that we implement efficient procedures for planning and applications for the 4- and 5-star hotels. After that they can start to build. Q: Asia Times recently reported that many international hotels were interested in returning because there was “less bureaucracy” and “fewer obstacles” to getting a license. What exactly has changed with regard to investing in the Myanmar tourism industry? A: We have set up the MIC [Myanmar Investment Commission] which will take care of all applications for foreign investment. They will reduce the red tape and fast-track the applications. Under Myanmar law, foreigners can invest 100 percent, but Myanmar people still must use their own money to invest—they get no help from the banks. Be creative and innovative when dealing with problems that had been neglected for so many years in the hands of mismanagement. Overhaul the entire infrastructure.If you don't know,say so .Learn from successful tourism industries.If need be hire qualified people.Don't be shy to learn.When you have no rooms for single or couples you can accommodate them in " welcome family visitors homes with bed-breakfast facilities "All difficulties can be resolved if you set your mind on them.Be creative and innovative!!! i am an english guy with experience in the tourist trade both in the UK and Thailand. I see Burma as a perfect place to open a small Guesthouse/western restaurant/bar ( and i am NOT talking girly bars here ) in a beach resort- i think this is the sort of small time investment that beach resorts could do with before the big Multi Nationals come trudling into town and destroy whole areas like what happened in Phi Phi in Thailand. My query is how practical is it for a one man band with limited capital ie not millions - to get set up in Burma within the next 12 months?